Aljona Savchenko (Ukrainian: Олена Валентинівна Савченко, Olena Valentynivna Savčenko; German Romanization: Aljona Sawtschenko, sometimes Aliona Savchenko; born 19 January 1984) is a Ukrainian-born German pair skater. One of the most decorated pair skaters, she is the 2018 Olympic Champion and two-time Olympic bronze medalist (2010, 2014), a six-time World Champion and a five-time Grand Prix Final champion. With current partner Bruno Massot, she is the 2018 Olympic champion, the 2018 World Champion, a two-time European silver medalist, the 2017–18 Grand Prix Final champion, and a two-time German national champion (2016, 2018). The pair hold the world record for best free skate score and best total score, and they are the first pair skaters to break 160 points in the free skate. With former partner Robin Szolkowy, she is the 2010 and 2014 Olympic bronze medalist, a five-time World champion (2008, 2009, 2011, 2012, 2014), a four-time European champion (2007–2009, 2011), a four-time Grand Prix Final champion (2007, 2010, 2011, 2013), and an eight-time German national champion (2004–2009, 2011, 2014). Savchenko and Szolkowy received the first 10.0 component scores ever given by a judge under the ISU Judging System. Savchenko originally represented Ukraine with Dmitri Boyenko and later Stanislav Morozov. With Morozov, she was the 2000 World Junior champion, the 1999–2000 Junior Grand Prix Final champion, and a two-time Ukrainian national champion. Aliona Savchenko was born in Obukhiv, near Kiev, and raised with three brothers. Her father is a former weightlifter. In April 2010, Savchenko became godmother to Galina Efremenko's daughter. In 2014, she worked with the German Red Cross on an aid project for eastern Ukraine. In April 2015, Savchenko announced her engagement to Liam Cross. The couple married on 18 August 2016. Savchenko became interested in figure skating after seeing it on television. She began skating at age five and practiced with her father on a lake. She convinced her parents to let her skate at a rink 50 km away, although it required her arriving at a bus stop at four in the morning for a two-hour ride to the rink. Savchenko turned to pairs at age 13, saying "I saw the other skaters doing it and I wanted to do it myself. I liked all the acrobatic things like lifts and twists and throws." Savchenko and her first partner, Dmytro Boyenko, were coached by Olexander Artychenko, and represented Ukraine under the auspices of the club Dynamo Kiev. The pair split after the 1998 World Junior Championships where they placed 13th. Her next partner, Stanislav Morozov, was also from club Dynamo Kiev. They were coached by Halyna Kukhar and won the 2000 World Junior Championships, twice won the Ukrainian National title, and placed 15th at the 2002 Winter Olympics. Savchenko's partnership with Morozov dissolved in 2002 because of health issues. She considered partnering with Anton Nimenko from Russia, however, the Ukrainian skating federation would not fund his move to Kiev. She was frustrated by the lack of support for skaters in Ukraine. Savchenko told a German journalist she was looking for a partner. He spoke to German coaches and suggested Robin Szolkowy, whom she recognized from a competition. In May 2003, Savchenko and Szolkowy had a successful tryout in Chemnitz, Germany. Three months later, she relocated to Germany and the new team began training in earnest with former World champion Ingo Steuer as their coach. When they first teamed up, they had to adjust to the fact that they had been taught different basics. Savchenko/Szolkowy worked mostly in Chemnitz, training twice a day, six days a week. Ingo Steuer served as their coach, choreographer, skate sharpener, and music cutter. Savchenko designed the pair's costumes. When the Chemnitz ice rink was melted – generally from the start of April to mid-May – they trained in Dresden if they needed ice time during this period. In their first season together, Savchenko/Szolkowy won the German national title. They made their international debut as a team at the start of the 2004–05 season. They again won the German National pair title, placed fourth at 2005 European Championships and sixth at the 2005 World Championships. Savchenko/Szolkowy earned their first Grand Prix gold medal at the Skate Canada International, placing first in both programs, and went on to win the bronze medal in their first appearance at the Grand Prix Final. After winning their third national title, Savchenko/Szolkowy took the silver medal in their second appearance at the European Championships. They finished 7.79 points behind champions Tatiana Totmianina / Maxim Marinin. Savchenko was granted German citizenship on 29 December 2005, making it possible for the pair to compete at the 2006 Winter Olympics. Just prior to the Olympics, the National Olympic Committee of Germany decided to exclude their coach, Ingo Steuer, from the Olympic team due to his collusion with the Stasi. After a court battle, he was granted accreditation. Savchenko/Szolkowy finished sixth with 180.15 points. They also placed sixth at the 2006 Worlds some weeks later, where they earned 170.08 points overall. Savchenko and Szolkowy at the 2007 German Championships. The German Ministry of Interior Affairs continued to put pressure on the German Skating Federation over the Steuer affair. As a result, the pair's coach was denied accreditation for the upcoming competitions but the team challenged this in court and won. However, the pair's refusal to leave their coach cost Szolkowy his place in the German army, which had sponsored his skating. Private sponsors and fans supported the pair. 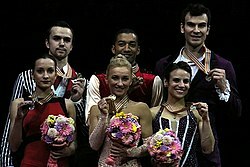 Savchenko/Szolkowy placed third at the 2006 Cup of China and won the 2006 Cup of Russia, qualifying them to the 2006–2007 Grand Prix Final, held in Saint Petersburg. They finished second with a total of 180.67 points, 22.52 behind Shen Xue / Zhao Hongbo, who won gold. In January 2007, they won their fourth German national title. Savchenko/Szolkowy won the European Championships for the first time, becoming the first German pair skaters to win the title in twelve years; their coach, Ingo Steuer, had won with Mandy Wötzel in 1995. They won the short program with 65.38 points, although Savchenko fell on the throw triple flip. In the free skate, they set a new personal best of 134.01 points while skating to the soundtrack of the film The Mission. Their combined total of 199.39 points was also a new best, and they finished 19.78 points ahead of silver medalists Maria Petrova / Alexei Tikhonov. Savchenko/Szolkowy made their third World appearance at the 2007 World Championships. Second in the short program and third in the free skate, they won their first World medal, a bronze. Their total score was 16.11 points behind gold medalists Shen/Zhao. Savchenko/Szolkowy won gold at the 2007 Skate Canada, silver at the 2007 Cup of Russia (second to Zhang Dan / Zhang Hao), and gold at the 2007 NHK Trophy. At the 2007–08 Grand Prix Final in December 2007, Savchenko/Szolkowy scored 72.14 in the short program, setting a new world record, and a season's best of 127.09 points in the free skate to win the pair title with 199.23 overall, eight points ahead of silver medalists Zhang/Zhang. In January 2008, Savchenko/Szolkowy successfully defended their European title. Finishing first in both segments with a total score of 202.39 points, they won their second European title by a 32.98-point lead over silver medalists Maria Mukhortova / Maxim Trankov. At the 2008 World Championships, held in Gothenburg, Sweden, they placed second in the short program, 2.36 points behind Zhang/Zhang of China, and first in the free skate, 6.74 ahead of Jessica Dubé / Bryce Davison. Overall, Savchenko/Szolkowy finished 5.04 points ahead of silver medalists Zhang/Zhang and won their first World Championship title. In the 2008–2009 season, Savchenko/Szolkowy won both of their Grand Prix assignments, the 2008 Skate America and the 2008 Trophée Eric Bompard. They took the bronze medal at the 2008–09 Grand Prix Final, earning a season's best of 70.14 in the short program and placing third in the long program with a score of 114.95. Overall, they earned 185.09 points to finish 6.40 points behind gold medalists Pang Qing / Tong Jian. In late January 2009, they competed at the 2009 European Championships as the defending champions. After placing second in the short program, 2.98 behind Maria Mukhortova / Maxim Trankov, they won the free skate with a season's best score of 132.43 points and won the competition overall with a total of 199.07 points, 16.30 points ahead of silver medalists Yuko Kavaguti / Alexander Smirnov. This earned Savchenko/Szolkowy their third consecutive European title. Savchenko/Szolkowy went to the 2009 World Championships as the defending champions. Despite Savchenko fighting a flu, they tallied a personal best 72.30 points in the short program to take the lead by a margin of 3.36 points over Kavaguti/Smirnov. They also won the free skate with 131.18 points. A throw triple salchow on the last beat of their music in the long program ensured victory. They finished with a combined total of 203.48 points, another personal best, and won by almost 17 points over silver medalists Zhang Dan / Zhang Hao. Savchenko/Szolkowy were the first German pair since Marika Kilius / Hans-Jürgen Bäumler (1963 and 1964) to successfully defend a World Championship title. Savchenko and Szolkowy at the 2010 World Championships. Savchenko/Szolkowy began the 2009–2010 season at the 2009 Nebelhorn Trophy. They finished first in both segments and earned the gold medal with a total score of 185.99 points. At their first Grand Prix of the season, the 2009 Trophée Eric Bompard, the pair placed first in the short program with a new personal best score of 72.98 points, leading by 6.1 points over Maria Mukhortova / Maxim Trankov, but finished fourth in the free skate with 101.44 points. Overall, they won the bronze medal with 174.42 points, 18.51 behind gold medalists Mukhortova/Trankov. On the plane back to Germany, Steuer suggested scrapping their long program to You'll Never Walk Alone, which had been recorded for them by André Rieu's orchestra in Maastricht. Although they had worked on the program since May, Savchenko said it "just didn't suit us", so they decided to prepare a new one to the soundtrack of Out of Africa. At the 2009 Skate Canada, Savchenko/Szolkowy won the short program, improving their personal best to 74.16 points, and leading the rest of the field by 8.36 points. They also won the free skate with a score of 132.55 points, placing first overall with 206.71 points, 21 ahead of Mukhortova/Trankov. They set a new world record for pairs' combined total under the ISU Judging System. It was also the first time a judge gave a 10.0 under the Code of Points. Their placements in their two 2009–10 Grand Prix events qualified them for the 2009–10 Grand Prix Final that was held in Tokyo, Japan, in December 2009. Savchenko/Szolkowy placed second in the short program with 73.14 points, 2.22 behind Shen Xue / Zhao Hongbo. However, they finished fourth in the free skate with 127.24 points. They won the bronze medal overall with 200.38 points, 13.87 behind gold medalists Shen/Zhao. Savchenko developed a flu during the Grand Prix Final which worsened and forced the pair to withdraw from German Nationals. At the 2010 European Championships, Savchenko/Szolkowy led in the short program with 74.12 points, by just 0.2 over Yuko Kavaguti / Alexander Smirnov. They placed second in the free skate with a new personal best 137.60 points, 1.63 behind gold medalists Kavaguti/Smirnov, who consequently placed first in the free skate and overall. Overall, Savchenko and Szolkowy earned a new personal best score of 211.72 points. At the 2010 Winter Olympics in Vancouver, British Columbia, Canada, Savchenko/Szolkowy earned their personal best score of 75.96 points in the short program, yet only placed second. Shen/Zhao took the top stop with a world record short program score of 76.66 points. They placed third in the free skating with 134.64 points, 7.16 behind Pang Qing / Tong Jian, who placed first in that segment. Overall they won the bronze medal with 210.60 points, 5.97 behind gold medalists and Olympic champions Shen/Zhao and 2.71 behind silver medalists Pang/Tong. Savchenko/Szolkowy ended their season at the 2010 World Championships. They placed third in the short program with 69.52 points, which was 5.76 behind leaders Pang/Tong. In the free skate they placed second with a score of 135.22 points, 0.89 behind Pang/Tong, who also won that segment to capture the gold medal. Overall, the team totaled 204.74 points to win the silver medal. Following the Olympics, Savchenko/Szolkowy both concluded they would like to continue competing at least another season. Savchenko/Szolkowy toured in multiple ice shows around the world, including the 2009 Ice All Stars, All That Skate in South Korea, and the 2010 Art on Ice in Lausanne, Switzerland. Savchenko and Szolkowy perform their short program at the 2011 European Championships. After performing in fifteen shows, Savchenko/Szolkowy began training for the 2010–2011 season in May 2010 in Chemnitz. The pair experimented with a throw quad flip in training. Steuer said, "It did work sometimes, but it needs extremely high concentration." In September 2010, Savchenko stated that they "plan to continue through 2014, but you never know if our bodies will work as we like them to work." Savchenko/Szolkowy won 2010 Skate America by over 20 points and 2010 Trophée Eric Bompard by 14 points, and were the top qualifiers for the 2010–11 Grand Prix Final. On their way back from France, the airline lost their luggage containing their skates, resulting in concerns the pair would be forced to withdraw from the Grand Prix Final. Skates were not permitted as part of hand luggage, the blades being considered potential weapons. The airline found their luggage a few days later. They placed first in both the short and long program at the 2010–11 Grand Prix Final to win the title. At the European Championships, Savchenko/Szolkowy won the short program by almost three points, receiving a perfect ten for performance and execution from one of the judges. In the long program, the pair received zero points for a spin after an error by Savchenko; they placed second in the free program by less than a point, finishing first overall to win their fourth European title ahead of 2010 champions Kavaguti/Smirnov. Their training ice was scheduled to be melted in late March, after they would normally have left for the World Championships, however, the competition was postponed to late April. They were able to get their ice time extended until Easter, with the city and sport association negotiating the finances. At the 2011 World Championships, Savchenko/Szolkowy were in second place following the short program. They went on to win their third World Championships with a record-breaking free skate. Their total score was also a new world record. With this win, the pair capped off a season in which they won every event they entered. Savchenko/Szolkowy took up the option of competing at three Grand Prix events during the 2011–2012 season. They are entered in 2011 Skate America, 2011 NHK Trophy and 2011 Cup of Russia. In October, they confirmed Pina and Angels & Demons as their new music selections and said they were practicing a throw triple Axel, successfully executed in international competition by only one previous pair, Americans Rena Inoue / John Baldwin at the 2006 Winter Olympics. At Skate America, Savchenko/Szolkowy attempted the throw triple axel in the short program but experienced a hard fall. They were given credit for completing the revolutions and finished in 5th place, 3.4 points off the lead. They rebounded to place first in the free skate and won their second consecutive Skate America title and third in their career. They added a reverse lasso lift to their free program but performed only a double twist because they were still working on a new entry to the triple. They attempted the throw triple axel again in the short program at 2011 NHK Trophy but Savchenko took another hard fall. They finished third at the event. Savchenko/Szolkowy rebounded to win the 2011 Rostelecom Cup. They qualified for the 2011–12 Grand Prix Final. Although they did not attempt it in Russia, they said they had not ruled out the triple axel. At the Grand Prix Final, Savchenko/Szolkowy won the gold medal with a total score of 212.26, defeating Volosozhar/Trankov by a margin of only 0.18 points. Savchenko/Szolkowy missed their nationals with the German Skating Union's okay and continued to work on the throw triple axel. In October 2011, Savchenko/Szolkowy were awarded the public prize at Germany's tenth and final Unity Prize ceremony. In January 2012, they were voted Saxony's Sports Team of 2011. Savchenko ruptured a muscle fiber in her left upper thigh as a result of a fall in training on 12 January 2012. Because she was not fully fit, the pair considered withdrawing from the 2012 European Championships (pairs event 25–26 January) or reducing the level of planned difficulty but said they feared a withdrawal would result in a one-year ban from competition if they performed in 2–8 February Art on Ice shows, a significant source of income (around 80,000 euros) for the pair which receives no funding from the German federation. By the start of the competition, Savchenko was able to land jumps and throws but spins aggravated her injury, causing the pair to withdraw before the short program on 25 January. At the 2012 World Championships in Nice, France, Savchenko/Szolkowy were first in the short program on 28 March. After falls on previous competition attempts, Savchenko landed the throw triple Axel for the first time in their career but her free foot touched the ice. On 29 March, Szolkowy lost a court case seeking reinstatement to the Bundeswehr which funded his sports career until 2006 – the court stated he did not have an authorized coach. Savchenko/Szolkowy were second in the free skate on 30 March but finished first overall. They won their fourth World title – becoming the fifth pair in the post-World War II period to do so – by a margin of 0.11 points over silver medalists Volosozhar/Trankov. Savchenko/Szolkowy began the season with gold at the 2012 Skate Canada International, although Savchenko had a flu. Officials elected not to impose a deduction after Szolkowy violated the regulation against men wearing tights. Steuer said they would consider making some adjustments. Their colorful costumes received a mixed reaction, with one Canadian journalist describing them as "something that looked like the cat threw up", however, Szolkowy said he was pleased with the results of their collaboration with a Chemnitz design studio. On 8 November 2012, it was announced that Savchenko/Szolkowy had signed a three-year agreement with their first major sponsor, ThomasLloyd, a Swiss investment banking group. Szolkowy said that they no longer had to worry about finances. The pair said they were uncertain if they would compete at their second Grand Prix assignment, the 2012 Trophée Eric Bompard, due to Savchenko's illness. Savchenko's cold having developed into a severe sinus infection, the pair confirmed their withdrawal a week later. Since ISU rules do not allow another GP event to be given if skaters withdraw for any reason from an assignment, this also meant they would not qualify for the Grand Prix Final in Sochi. They won silver medals at both the 2013 European Championships and the 2013 World Championships. Savchenko/Szolkowy were assigned to the 2013 Cup of China and the 2013 Rostelecom Cup as their Grand Prix events. They finished second in the short program but won the free skate to claim the Cup of China title, making them only the second pair to win all six Grand Prix events. At the 2013–14 Grand Prix Final, Savchenko/Szolkowy edged out Volosozhar/Trankov for the gold medal after placing second in the short and first in the free setting a new personal best scores total of 227.03 points. They then competed at the 2014 European Championships but withdrew after the short program because of Savchenko's flu. At the 2014 Winter Olympics in Sochi, Russia, Savchenko/Szolkowy earned the bronze medal. They placed second in the short program and fourth in the free skate. During the free skate, Szolkowy fell on the pair's side-by-side triple jumps and Savchenko fell on the throw triple axel at the conclusion of the program and dropping to third in the overall standings behind Ksenia Stolbova / Fedor Klimov. Savchenko/Szolkowy decided to compete at the 2014 World Championships and won their fifth world title together. They have the second-most world championship titles in pairs, second only to Irina Rodnina / Alexander Zaitsev. Szolkowy then retired from competition, leading Thomas Lloyd to end its sponsorship, in July 2014. Savchenko decided to continue competing, a possibility she had considered since the 2013 Cup of China. On 29 March 2014, it was reported that she would team up with France's Bruno Massot. The two began training together in April, working to adjust to each other's different technique. They made their first appearance as a pair at the 2014 All That Skate shows in South Korea. Because Chemnitz melted its ice rink until nearly the end of August, they trained in Coral Springs, Florida for two months beginning in mid-July. Since the ISU does not allow any pairing to compete under two flags, one partner was obliged to change country and could not compete internationally until the previous country granted a release. In July 2014, Savchenko said she preferred to continue competing for Germany while Massot preferred France. On 29 September 2014, the Deutsche Eislauf-Union announced that the pair had decided to skate for Germany. In October 2014, Savchenko/Massot started training in Oberstdorf, coached by Alexander König. On 9 June 2015, Massot's mother announced that the French Figure Skating Federation (FFSG) had refused to release Massot to skate for Germany. On 31 August 2015, the FFSG reportedly demanded a release fee of 70,000 euros from Massot, later agreeing to 30,000 euros. He was released to skate for Germany on 26 October 2015. Savchenko/Massot made their debut at the 2015 CS Tallinn Trophy, an ISU Challenger Series (CS) event, where they won the gold medal. That was followed by gold at the 2015 CS Warsaw Cup and German Championships. In January, they won silver at the 2016 European Championships in Bratislava, Slovakia. In April, they won the bronze medal at the 2016 World Championships in Boston, having placed fourth in the short program and third in the free skate. After taking gold at the 2016 CS Nebelhorn Trophy, Savchenko/Massot won both of their Grand Prix events, the 2016 Rostelecom Cup and 2016 Trophée de France. On 12 November, Savchenko tore a ligament in her right ankle on the landing of the throw triple Axel during the free skate in France. She decided to continue skating due to the possibility of a medal and being in a partnership, saying "If you were alone you might just throw in the towel, but there is that other half of the pair, who is also competing." She stated, "Luckily, the ligaments were not completely ruptured, but it takes eight to twelve weeks to heal." As a result, the pair withdrew from their December competitions, the Grand Prix Final and German Championships. In January 2017, Savchenko/Massot won the silver medal, behind Russia's Evgenia Tarasova / Vladimir Morozov, at the 2017 European Championships in Ostrava, Czech Republic. In April, the pair received the silver medal, behind China's Sui Wenjing / Han Cong, at the 2017 World Championships in Helsinki, Finland. Savchenko/Massot began their season with silver at the 2017 CS Nebelhorn Trophy. Turning to the Grand Prix series, they took silver at the 2017 Skate Canada International after placing first in the short program and second in the free skate. Ranked third in the short and first in the free, the pair won gold at the 2017 Skate America. Their results qualified them to the Grand Prix Final in December, which they won with a world record score. In November 2017, Massot received German citizenship, allowing the pair to compete for Germany at the 2018 Winter Olympics. Savchenko and Massot withdrew from the European Figure Skating Championships on 12 January, in order to focus on preparations for the Olympics. At the 2018 Winter Olympics, the pair competed in the first part of the team event. Savchenko and Massot then competed in the individual pairs event. They placed fourth in the short program after Massot doubled an intended triple jump. On 15 February 2018, they set a new world record score of 159.31 in the free skate. With their aggregate combined score, Savchenko and Massot won the gold medal, edging out edging out world champions Wenjing Sui and Cong Han of China (who were leading after the short program) by just 0.43 points, in spite of mark manipulation from Chinese judge Huang Feng (who was later investigated by the ISU and banned). At age 34, Savchenko became one of the oldest women to win an Olympic gold medal in figure skating, and the first female European figure skater to win gold at all major ISU championships. Savchenko commented on the occasion: "I never give up. All my life I've been fighting." Savchenko and Massot ended the season at the 2018 World Championships in Milan, Italy, where they won the world title, Massot's first and Savchenko's sixth. They set new personal bests in both the short and free programs, in the process setting new world records for the free skate and combined score. Following their World Championship victory, it was announced that the pair would be taking an indefinite break from competition. During her competitive years Savchenko was 12 times part of 'Art on Ice' in Switzerland. She also skated at 'All that skate' in Korea, 'Emotions on Ice' in Germany, 'Music on Ice' in Switzerland, 'Plushenko and Friends', 'Opera on Ice' and 'Hit on Ice' in Italy and several shows in Japan. 2018/19 she and Massot were the star guests of 'Holiday in Ice': Showtime. And ambassadors of the newly found 'Holiday in Ice Academy'. They decided not to skate any shows in spring and summer of 2019. On 14 May 2018, it was announced that Savchenko would take a coaching position overseeing American pairs skaters Alexa Scimeca Knierim and Chris Knierim. She said that they planned to divide their time between the United States and Oberstdorf, Germany. Their collaboration ended in October 2018. Savchenko started coaching Hatakawa after her previous coach moved to away under Savchenko's guidance Hatakawa started performing triple jumps and won German Novice Nationals 2019. From 2019 on Hanna Keiß became part of the group. Savchenko choreographed several of her exhibition progams with Massot. Most famous and admired from many fans but also other skaters, coaches and choreographers is their 2017/18 program 'up all night". She also had a lot of influence in their competitive programs as she e.g. created the iconic beginning of their olympic free skate. Programs choreographed by her also include the 2017/18 free skate of Annika Hocke / Ruben Blommaert that they performed at the European and World Championships as well as at the Olympics. ^ a b Mittan, J. Barry (21 November 2009). "Savchenko, Szolkowy win convincingly in Canada". Icenetwork.com. Archived from the original on 23 November 2009. ^ a b Ivanov, Vladimir (13 April 2010). Алена Савченко: "В паре — как в жизни". Часть вторая [Aliona Savchenko, Part 2.] (in Russian). telegraf.lv. Archived from the original on 13 December 2011. ^ a b c d Ivanov, Vladimir (12 April 2010). Алена Савченко: "Цель одна — "золото" Олимпиады". Часть первая [Aliona Savchenko: "One goal: Olympic gold". Part 1.] (in Russian). telegraf.lv. Archived from the original on 13 December 2011. ^ Nagel, Ramona (17 September 2014). "Wir kannten Krieg bislang nur aus Filmen" [Before we knew war only from movies]. Freie Presse (Saxony) (in German). ^ "Congratulations!". Facebook. Facebook. Retrieved 5 November 2015. ^ Nagel, Ramona (18 August 2016). "Gepokert und gewonnen: Eiskunstläuferin Aljona Savchenko heiratet Liam Cross" [Figure skater Aliona Savchenko marries Liam Cross]. Freie Presse (Saxony) (in German). Archived from the original on 24 August 2016. ^ a b c d e Mittan, Barry (27 February 2005). "German Pair Nears the Top". Skate Today. ^ a b c "Vision Gold – Eiskunstlaufen". Schmidt Media TV. 24 November 2011. Retrieved 13 December 2011. ^ "World Junior Figure Skating Championships: Pairs" (PDF). International Skating Union. Archived from the original (PDF) on 4 November 2013. ^ a b Savchik, Anna (28 January 2010). Паспорт на медаль [Passport for a medal] (in Russian). sport.ua. Archived from the original on 13 December 2011. ^ a b Vaytsekhovskaya, Elena (9 December 2011). Инго Штойер: "Главное – не стоять у Савченко на пути" [Ingo Steuer: "The main thing – do not stand in Savchenko's way"]. sport-express.ru (in Russian). Retrieved 9 December 2011. ^ a b Vernon, Nadin (4 December 2010). "An interview with Ingo Steuer". AbsoluteSkating.com. Retrieved 4 December 2010. ^ a b "Interview Savchenko/Szolkowy (Worlds 2010)". figureskating-online. 20 June 2010. Retrieved 4 July 2011. ^ a b Rutherford, Lynn (21 October 2011). "Savchenko, Szolkowy tackle throw triple Axel". Icenetwork. Retrieved 21 October 2011. ^ a b c d e f Flade, Tatjana (10 July 2007). "Mission accomplished". GoldenSkate.com. Retrieved 15 September 2010. ^ "ISU Grand Prix of Figure Skating Final, Day 1". International Skating Union. Archived from the original on 12 March 2012. Retrieved 22 November 2009. ^ Kondakova, Anna (22 January 2008). "Savchenko and Szolkowy lead pairs at Europeans". Golden Skate. ^ Kondakova, Anna (23 January 2008). "Savchenko and Szolkowy take European title". Golden Skate. ^ Kondakova, Anna (21 January 2009). "Mukhortova and Trankov take surprise lead at Europeans". Goldenskate.com. Retrieved 7 April 2012. ^ Kondakova, Anna (22 January 2009). "Savchenko and Szolkowy take third consecutive European title". Goldenskate.com. Retrieved 7 April 2012. ^ "Savchenko/Szolkowy in der Goldspur" [Savchenko / Szolkowy going for gold] (in German). news.de. 25 March 2009. Archived from the original on 22 July 2011. Retrieved 5 April 2011. ^ "2009 World Championships Pairs results". Archived from the original on 27 March 2009. Retrieved 27 March 2009. ^ a b c Flade, Tatjana (24 November 2009). "Aliona Savchenko and Robin Szolkowy: Back in business". GoldenSkate.com. Archived from the original on 15 August 2011. Retrieved 15 September 2010. ^ Vernon, Nadin (2009). "Aljona Savchenko and Robin Szolkowy: "We like to feel the atmosphere of the arena before we go out to skate"". AbsoluteSkating.com. Retrieved 23 December 2010. ^ "ISU Grand Prix of Figure Skating – HomeSense Skate Canada International, Day 2". International Skating Union. Archived from the original on 25 November 2009. Retrieved 22 November 2009. ^ a b Flade, Tatjana (9 May 2010). "Germans are ready for another four years". GoldenSkate.com. Retrieved 15 September 2010. ^ Yi, Whan-woo (4 June 2010). "Yu-na, Kwan to do another show in July". The Korea Times. Archived from the original on 27 October 2012. Retrieved 3 October 2011. ^ a b Russell, Susan D. (19 January 2011). "Savchenko and Szolkowy Unfinished Business". IFS Magazine. Archived from the original on 21 January 2012. ^ a b Rutherford, Lynn; Kany, Klaus-Reinhold (21 September 2010). "Tough-talking Germans vow to smile more". icenetwork.com. Retrieved 23 September 2010. ^ "Savchenko/Szolkowy fordern Weltmeister" [Savchenko/Szolkowy aim for the World title]. dpa / Eurosport (in German). Eurosport.de. 9 December 2010. Archived from the original on 13 December 2011. ^ "Grand-Prix-Start von Savchenko/Szolkowy gefährdet" [Grand Prix event of Savchenko / Szolkowy at risk]. SID (in German). zeit.de. 3 December 2010. Archived from the original on 13 December 2011. ^ "Gepäck wieder da, Savchenko/Szolkowy zum GP-Finale" [Luggage back]. SID (in German). focus.de. 6 December 2010. Archived from the original on 13 December 2011. ^ Kondakova, Anna (10 December 2010). "Germans dominate pairs at the Grand Prix Final". Goldenskate. Retrieved 23 September 2011. ^ Kondakova, Anna (11 December 2010). "Savchenko and Szolkowy win Grand Prix title". Goldenskate. Retrieved 23 September 2011. ^ Flade, Tatjana (26 January 2011). "Savchenko and Szolkowy win pairs short; aim for fourth title". Goldenskate.com. Retrieved 31 March 2011. ^ Flade, Tatjana (27 January 2011). "Savchenko and Szolkowy skate to fourth European title". Goldenskate.com. Retrieved 31 March 2011. ^ "Savchenko/Szolkowy mit optimalen Bedingungen" [Savchenko / Szolkowy with optimal conditions]. Deutsche Presse-Agentur (in German). Financial Times Deutschland. 28 March 2011. Archived from the original on 13 December 2011. Retrieved 13 December 2011. ^ Flade, Tatjana (27 April 2011). "Pang and Tong lead pairs in Moscow". GoldenSkate. Retrieved 29 April 2011. ^ Flade, Tatiana (28 April 2011). "Savchenko and Szolkowy skate off with record and third World title". GoldenSkate. Retrieved 29 April 2011. ^ Vernon, Nadin (13 October 2011). "Robin Szolkowy: "Our new free program? You'll either love it or you'll hate it!"". Absolute Skating. Retrieved 14 October 2011. ^ a b c Flade, Tatjana (15 December 2011). "Savchenko and Szolkowy push the limits". Golden Skate. Retrieved 16 December 2011. ^ Rutherford, Lynn (23 October 2011). "Zhangs edge Denney, Coughlin in short". Icenetwork. Retrieved 24 October 2011. ^ "Pairs short programs: Judges details per skater" (PDF). International Skating Union. 22 October 2011. Retrieved 24 October 2011. ^ Walker, Elvin (23 October 2011). "Savchenko and Szolkowy seize third Skate America title". GoldenSkate. Retrieved 24 October 2011. ^ Rutherford, Lynn (23 October 2011). "Savchenko, Szolkowy win Skate America title". Icenetwork. Retrieved 24 October 2011. ^ Flade, Tatjana (12 November 2011). "Kavaguti and Smirnov win second gold of the season at NHK Trophy". Golden Skate. ^ Rutherford, Lynn (26 November 2011). "Germans put out commanding performance". Ice Network. ^ Rutherford, Lynn (8 December 2011). "Germans still flirting with throw triple Axel". Ice Network. Retrieved 9 December 2011. ^ Rutherford, Lynn (10 December 2011). "Pairs come tantalizingly close to perfection: Savchenko and Szolkowy, Volosozhar and Trankov in class of their own". Ice Network. Retrieved 14 December 2011. ^ Flade, Tatjana (11 December 2011). "Savchenko and Szolkowy defend Grand Prix pairs title". Golden Skate. Retrieved 16 December 2011. ^ Flade, Tatjana (10 December 2011). "Volosozhar and Trankov take lead in pairs at Grand Prix Final". Golden Skate. Retrieved 16 December 2011. ^ "Eiskunstlauf – DM: Savchenko/Szolkowy: Lieber Axel statt achter Titel" [Savchenko/Szolkowy choose Axel over an eighth title]. Deutsche Presse-Agentur (in German). Sueddeutsche.de. 5 January 2012. Archived from the original on 23 January 2012. ^ Baig, Rachel Y (3 October 2011). "Germany awards last-ever Unity Prize amid reunification celebrations". Deutsche Welle. Archived from the original on 13 December 2011. ^ "Sachsens Sportler des Jahres 2011 in Dresden geehrt" [2011 Saxony Sportsmen of the Year Awards in Dresden] (in German). Leipzig-seiten.ce. 16 January 2012. Archived from the original on 23 January 2012. ^ Kany, Klaus-Reinhold (22 January 2012). "Germans contemplate withdrawal from Euros". Ice Network. Archived from the original on 23 January 2012. ^ a b Kany, Klaus-Reinhold (24 January 2012). "Wounded Savchenko and Szolkowy in tough spot". Ice Network. ^ Martin, Martina (20 January 2012). "Eiskunstlauf-EM mit Savchenko/Szolkowy? Entscheidung kurz vor dem Start" [European Skating Championships with Savchenko/Szolkowy? The decision will be made shortly before the competition begins]. Sport-Informations-Dienst (in German). Freie Presse (Saxony). Archived from the original on 23 January 2012. ^ a b "Aliona Savchenko, Robin Szolkowy out". ESPN. Associated Press. 25 January 2012. ^ "Weiterer Schlag für deutsches Team" [Another blow for the German team] (in German). Mitteldeutscher Rundfunk. 26 January 2012. Archived from the original on 26 January 2012. ^ "Eiskunstlauf – EM: Savchenko/Szolkowy vertagen EM-Startzusage" [Savchenko/Szolkowy postpone decision on participating in European Championships]. Deutsche Presse-Agentur (in German). Sueddeutsche.de. 24 January 2012. Archived from the original on 25 January 2012. ^ Flade, Tatjana (26 January 2012). "Volosozhar and Trankov lead pairs at Europeans". Golden Skate. ^ a b Kondakova, Anna (28 March 2012). "Savchenko and Szolkowy land throw triple Axel; lead pairs in Nice". Golden Skate. ^ "Szolkowys Ausschluss als Sportsoldat rechtens" [Szolkowy's exclusion as a sports soldier lawful] (in German). MDR. 29 March 2012. Archived from the original on 31 March 2012. Retrieved 31 March 2012. ^ "Szolkowy verliert vor Gericht" [Szolkowy loses court case]. Deutsche Presse-Agentur (in German). Nordwest Zeitung. Archived from the original on 31 March 2012. ^ Kondakova, Anna (30 March 2012). "Savchenko and Szolkowy capture fourth World title". Golden Skate. ^ a b c d Flade, Tatjana (31 October 2012). "Savchenko and Szolkowy off to strong start in pre-Olympic season". Golden Skate. ^ a b "Sponsor für Savchenko/Szolkowy" [Savchenko/Szolkowy obtain a sponsor]. sport1.de (in German). 8 November 2012. Archived from the original on 12 November 2012. ^ a b "Eiskunstlauf: Savchenko/Szolkowy erstmals mit Sponsor" [Figure skating: Savchenko/Szolkowy with a sponsor]. Deutsche Presse-Agentur (in German). Stern. 8 November 2012. Archived from the original on 12 November 2012. ^ Kany, Klaus-Reinhold; Rutherford, Lynn (14 November 2012). "Savchenko, Szolkowy out of Bompard, GP Final". IceNetwork. ^ "Savchenko/Szolkowy sagen Start in Paris ab" [Savchenko/Szolkowy withdraw from Paris event]. Deutsche Presse-Agentur (in German). Stern. 14 November 2012. Archived from the original on 15 November 2012. ^ "Savchenko verliert Sponsoren" [Savchenko loses sponsors]. Mitteldeutscher Rundfunk (in German). 18 July 2014. Archived from the original on 21 July 2014. ^ Tone, Florentina (16 April 2014). "Aliona Savchenko: "If you don't take the risk, you will never win"". InsideSkating.net. ^ Flade, Tatjana (1 July 2014). "New pair team Savchenko and Massot aim high". Golden Skate. ^ a b Kany, Klaus-Reinhold; Rutherford, Lynn (9 July 2014). "Decision time looms for pair Savchenko, Massot". IceNetwork. ^ "Savchenko/Massot zum Sommertraining in die USA" [Savchenko/Massot's summer training in the United States] (in German). focus.de. Sport-Informations-Dienst. 17 June 2014. ^ Kayser, Sebastian (27 July 2014). "Eisprinzessin Savchenko kündigt Vierfach-Axel an" [Ice princess Savchenko says she will try quad Axel]. Bild (in German). ^ "Constitution and General Regulations 2012" (PDF). International Skating Union. June 2012. Archived from the original (PDF) on 2 July 2013. ^ "Patinage Artistique: Situation du Couple A.SAVCHENKO / B.MASSOT" [Figure skating: Savchenko/Massot situation] (PDF). Fédération Française des Sports de Glace (in French). 17 July 2014. Archived from the original (PDF) on 18 July 2014. ^ "Savchenko/Massot starten künftig für Deutschland" [Savchenko/Massot to compete for Germany]. Mitteldeutscher Rundfunk (in German). 29 September 2014. Archived from the original on 30 September 2014. ^ Nagel, Ramona (29 September 2014). "Savchenko/Massot starten künftig für Deutschland" [Savchenko/Massot will compete for Germany]. Freie Presse (Saxony) (in German). ^ "Frankreichs Bruno Massot wird neuer Partner von Paarlauf-Weltmeisterin Aljona Savchenko" [France's Bruno Massot will be new partner of World champion pair skater Aliona Savchenko] (in German). Schwäbisches Tagblatt. Sport-Informations-Dienst. 30 September 2014. ^ "Weltmeisterin in neuen Händen" (in German). Augsburger Allgemeine. 18 October 2014. Retrieved 20 October 2014. ^ International Figure Skating Magazine (10 June 2015). "French Federation refusing to release Bruno Massot" (Facebook). ^ "Franzosen wollen Geld" [French want money]. Sächsische Zeitung (in German). 31 August 2015. ^ "30.000 Euro für einen Paarläufer" [30,000 euros for a pair skater]. Deutsche Presse-Agentur (in German). Frankfurter Allgemeine Zeitung. 10 November 2015. Archived from the original on 5 March 2016. ^ Decool, Mélissa (30 January 2016). "Volosozhar and Trankov golden in Bratislava". Golden Skate. ^ Decool, Mélissa (13 October 2016). "Savchenko and Massot confident going into 2016-17". Golden Skate. ^ Decool, Mélissa (12 November 2016). "Savchenko and Massot take back-to-back Grand Prix gold". Golden Skate. ^ a b Flade, Tatjana (16 January 2017). "Coming off injury, Savchenko and Massot determined to compete at Europeans". Golden Skate. Archived from the original on 20 January 2017. Retrieved 19 January 2017. ^ a b Bőd, Titanilla (2 March 2017). "Aljona Savchenko and Bruno Massot: fighters sharing emotions and fun". Absolute Skating. ^ Decool, Mélissa (26 January 2017). "Tarasova and Morozov claim European pairs title". Golden Skate. ^ "49th Nebelhorn Trophy 2017 - Pairs". www.isuresults.com. Retrieved 25 November 2017. ^ Kany, Klaus-Reinhold (29 October 2017). "2017 Skate Canada International Pairs". Ice Skating International. ^ Rutherford, Lynn (24 November 2017). "Duhamel, Radford in command at Skate America". IceNetwork.com. ^ a b Rutherford, Lynn (25 November 2017). "Savchenko, Massot win gold with career-best free". IceNetwork.com. ^ Rutherford, Lynn (23 November 2017). "Endlich! Massot passes citizenship test on third try". IceNetwork.com. ^ "Bruno Massot gets German citizenship, opening path for Winter Games". Associated Press. ESPN. 24 November 2017. ^ a b Slater, Paula (23 March 2018). "Savchenko and Massot take first World title". Golden Skate. ^ Hess, Abigail (15 February 2018). "How 34-year-old Aljona Savchenko won her first gold medal during her fifth Olympics". CNBC. ^ Zaccardi, Nick (25 April 2018). "Olympic pairs champions take indefinite break". NBC Sports. ^ Kortemeier, Todd (14 May 2018). "Pairs Skaters Alexa Scimeca-Knierim And Chris Knierim Make Coaching Switch To Olympic Champ Aljona Savchenko". Team USA. ^ Berlot, Jean-Christophe (17 May 2018). "Savchenko intent on taking Knierims to next level". IceNetwork.com. Archived from the original on 1 July 2018. ^ Klimke, Barbara (21 October 2018). "Traineramt beendet". Süddeutsche Zeitung (in German). Archived from the original on 22 October 2018. ^ "Savchenko and Massot: 'It was a good fight'". Golden Skate. 25 November 2017. ^ a b 김, 희준 (20 April 2018). "올림픽 감동 재현한 봄의 아이스쇼…색다른 매력도 선보인 평창 스타들". Newsis. ^ ISU Grand Prix of Figure Skating 2017 Skate Canada International - Gala Exhibition (Television production). Eurosport. 29 October 2017. ^ Flade, Tatjana (October 2015). "Ailiona Savchenko and Bruno Massot: Play the waiting game". International Figure Skating Magazine. USA: Madavor Media. ^ Jangbro, Eva Maria (13 February 2012). "Art On Ice: A show that tickles the senses!". Absolute Skating. Retrieved 21 February 2012. ^ a b "Competition Results: Aliona SAVCHENKO / Bruno MASSOT". International Skating Union. ^ a b "Competition Results: Aliona SAVCHENKO / Robin SZOLKOWY". International Skating Union. Archived from the original on 21 April 2014. Wikimedia Commons has media related to Aliona Savchenko. Note: The team event at the Olympics is indicated by "T". Note: These records start from the 2018–19 season because of the introduction of the new –5/+5 GOE system.